Questions about a woman’s “place” resonate in our culture, and conventional ideas about the house as a feminine space persist. Global artists in Women House recast conventional ideas about the home through provocative photographs, videos, sculptures, and room-like installations. Martha Rosler, Cindy Sherman, and Karin Mack use cliché and irony in their photographs to deconstruct stereotypes of women as submissive housewives. The smiling woman in the photomontage appears content. 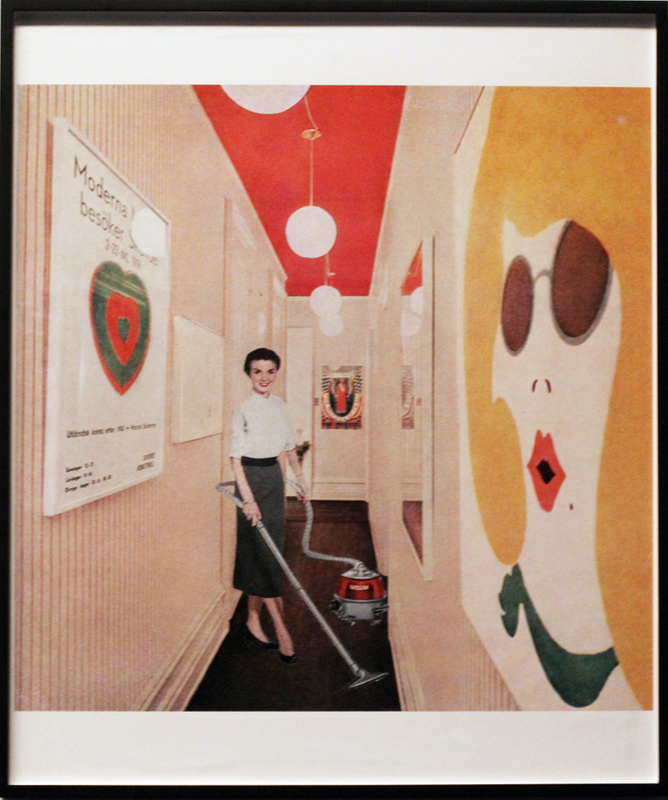 Although she is vacuuming, her clothes are crisp and her hair is styled. She is both a hardworking housewife who is happy to serve and an object for the male gaze. While the smile plastered on the woman’s face coupled with the bright colors of the art on the walls radiate cheerfulness, the narrow hallway is suffocating and restrictive—almost cage-like. Whether or not she is resigned to her role as housewife, the woman cannot escape. Drawing from pop-culture clichés, Cindy Sherman (b. 1954, Glen Ridge, New Jersey) explores notions of femininity and the construction of identity. In a series of photographs created from 1977 to 1980, Sherman evokes familiar images of women in stereotypical film roles, ranging from seductive bombshell, to subservient housewife, and ingénue. 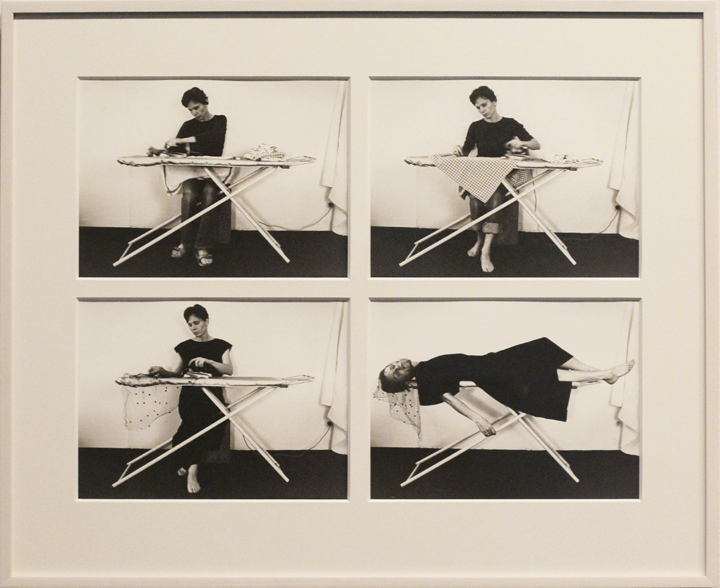 Woman and ironing board become one in Bügeltraum (Iron Dream), a series of four black-and-white photographs by Karin Mack (b. 1940, Vienna, Austria). The artist, dressed in a black shirt and jeans, irons a gingham cloth. By the third image, Mack trades her casual outfit for a black dress and the cloth becomes a sheer black veil. In the final photograph, Mack lays on top of the ironing board with the veil draped over her head, symbolizing the death of the housewife. Her body becomes part of the ironing board, highlighting her identity as an object rather than a person with agency. Mack’s subversive work underscores the struggles of many women artists in the 1970s who found their role as homemaker monotonous and often an obstacle to being taken seriously in a male-dominated art world. This entry was posted in NMWA Exhibitions and tagged Cindy Sherman, Karin Mack, Martha Rosler, Women House by Women in the Arts. Bookmark the permalink.